• How did you get into the business of Luxury Car Hire? I’ve always been around the wedding industry since a young age so I guess it was inevitable. After many years working for one of the leading Melbourne wedding photography studios I made the switch to get involved directly in the family business. I wanted to help carry to family legacy and bring its strong reputation to the new generation of couples. I had been helping to wash the fleet of cars on school holidays since a young age though and started chauffeuring since I was 21, It’s so great to work with family where everyone is on the same page and has the same attitude to providing the best service possible. As we are a family business I have learnt a lot about the industry and wedding car hire since a young age from my parents. Everything learnt has been from family, including mum, dad, aunties and cousins. Some of our drivers have been with us for 30 years (they have known me since I was a kid) and I have learnt a lot from them over the years. At 21 I started chauffeuring wedding cars and our experienced senior drivers showed me the ropes. Where are they now? Well funnily enough most of them are all still working in the business or industry so I guess the learning for me just never stops. • What’s the biggest mistakes and myths about wedding Car Hire? The biggest mistake couples make is leaving booking their wedding cars too late, many dates are booked well in advance and couples could not hire the cars they really loved for their big day. 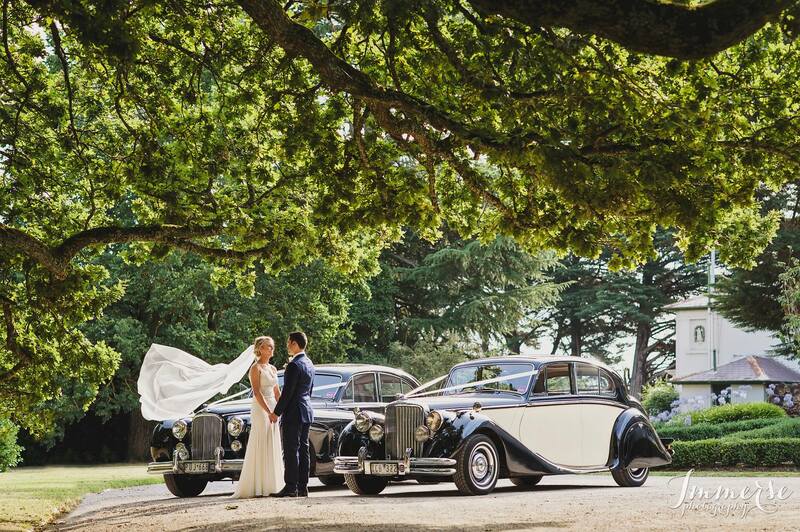 We emphasis to clients that these classic cars are more than just your transport on the day they are used in many of the wedding photos as backdrops and features in the photos and video. The added benefit of these classic luxury cars is that they really make you feel special and are not your ordinary vehicles. Being chauffeured around and pampered all day adds to the sense of style and sophistication that will be remembered long after the wedding day is over. We have found that clients are really being proactive in letting all their suppliers know what is happening on the day and that communication before the wedding, this will ensure the big day runs as smooth as possible . Many couples will supply us with a run sheet of the day with all the contact details of suppliers involved. We will often suggest recommendations on arrival and travel times and the logistics on the day based on our 35 years experience. The last thing we want the couple to be doing is stressing before the big day so communication and planning are key. A concerning trend we have seen in 2017 was for an increasing number of couples to leave booking their suppliers to the last minute. (in some cases 1-2 weeks before their wedding which leaves them disappointed when many companies are already booked out) We have also noticed how the wedding styling and themes are changing quicker than ever, Just like fast fashion what is ‘on trend’ one season may be out the next. One of the larger trends we have noticed is that many couples are choosing to hold their wedding on private properly out in the country and not necessarily at a dedicated wedding reception. These ‘farm style’ weddings are certainly gaining traction. Many couples are also ditching the old-school wedding reception in favor of hired event spaces and even restaurants or trendy bars around the inner city area. These spaces are perfect for a more casual cocktail style wedding. In this way the couple get to style and theme their own spaces to suit their individual style, this also leads to a more relaxed and intimate celebration without all the traditional trappings and clichés. • What trends do you see developing over the next few years? Less and less marriages in church’s as religion does not play as much of a role in peoples lives as it used. This could also mean wedding traditions and superstitions are becoming less prevalent, for example we have seen many couples walk down the isle together. Destination weddings are becoming more and more popular as the prices sometimes are sometimes cheaper than having a wedding in Australia. -Smaller bridal parties or no bridal parties at all. -More combined bucks and hens parties into one big celebration for everybody. -Couples are not as concerned with pleasing their parents/family with old traditions. They are creating a unique fun wedding celebration that will entertain all their guests and create a party atmosphere that is more suited to their style and personality. – As the cost of living rises here in Australia I also predict that many couples will opt for a smaller more intimate wedding with a greater emphasis on a smaller budget choosing to spend money on the things they really want and not necessarily what they are told they should have. Is working in the wedding industry your dream? Do you have a burning passion for it? The wedding industry is not easy, long days/nights, working most weekends and lots of pressure and stressed brides. If you live and breath weddings and have a deep passion for them then I say go for it. If you just want to get into the industry (like hundreds of others have before you) because you think you can make a quick buck then you will quickly realise its not that easy. If you decide to start your own wedding business the best thing to do would be to research the market, research your competitors and make sure you have a point of difference. Better yet see if you can work/help/train with one of the leading suppliers in your chosen field, this will give you an idea of the ins and outs of the industry and what you will learn will be invaluable. We suggest contacting us about your wedding cars at least 9-6 months in advance. Some popular wedding dates book out months in advance. Please keep in mind that Oct-March is peak wedding season so its best to get in early to secure your favourite cars.